General Observations: Eight Thunder storm events noted and 21 irrigation applications. Electrical fire near farmhouse after powerline broke along route 579. It seemed like a lot of tractor activity with late season plowing and haying, and lots of planting as the crew prepares for the end of the season. Finally MR expands the Big Garden Beds, plowing in a new section to the south of the Blackberries. Equipment 85 hrs: Up from 30 hours last year, 15 hours mowing with the Kabota, 25 hours with the Ford, 10 hours with the JD (it was only 5 last August) and 12.5 with our new Case 265. Seemed to be lots of Tractor time for our 2nd year Trainees KG and RR, cultivating and bedforming, also chisel plowing for KG. Haybine required removal of blade and reriviting of two cutter teeth. Observed and assisted by KG, RR and TH. Administration 25 hrs: As ever, accounting and payroll. Payroll for the month was $5,987 for 6 workers ($3,000 less than ’11). Cash coming in is regularly deposited and quarters and ones retrieved for the cashbox. Significantly less hours than last August, probably too busy in field. Infrastructure 100 hrs: Hard predation of chickens noted, down to 55 birds total. Field edges and Diversions mowed. 8/16 the fence lines and irrigation valves were weed wacked. MR pointed out clear example of soil erosion at the end of a newly planted field beds to crew. Emphasized the significance of soil loss even on a small scale – imagine how bad on a large scale. New BGB’s! finally plowed into shape by MR with JD using moldboard plow. Fairly roughly done, enough to clearly delineate the beds for excavator to finish the job. While Moldboard plow attached, MR modified the layout of the Fields in Veg. C, moving the central field to the North, to accommodate a poorly drained area between the south and mid sections. Disc harrow in use at end of month for rough tillage of fallow fields. Greenhouse 14.5 hrs: RR and KG slogged thru “hard work!” of clearing zinnias from Farmhouse Gothic in order to plant Tomatoes. During rainy days, transplants thinned. Weekly thereafter members of the crew trellised the House Tomatoes, pruning and clipping. By end of month, House Tomatoes yielding well but losing more than half to rodent damage – Critical to control rodent population – Cats adopted, but too late to protect this years crop. Composting 6 hrs: 10.5 cubic yards applied to fields, pre-planting. Planting 78 hrs: Training for KG and RR; bed forming and the associated tractor ‘Set-up’ of straight shanks and spyders. Ordered Cover Crop Seed; 1,200# Triticale Rye, 250# Hairy Vetch and 320# Winter Pea. CH filled out edges of Corner Garden with perennial Sweet William flowers. Nice notes of crew working well together, tuning up BGB’s for big direct seeding push on 8/17. Crop Care 174 hrs: Hand weeding in Salad mix, with heavy weed pressure and poor germination. Weeding and cultivating, Tomato Trellising both field and greenhouse. With increased irrigation towards end of month. Late Blight discovered in Ralphs House, MR cut down and buried effected plants under hay and plastic tarp in order to reduce spore distribution – seemed to contain the Blight from spreading. Harvesting 376 hrs: Down 200 hours from last year, was it increased efficiency or less to harvest? Multiple entries of Harvesting being disturbed by heavy t-storms in first half of August. Carrot yields from 100’ BGB’s of 500#! Special harvest and discussion of the ‘Wild Greens- Purslane’ from beds that had poor yield of the intended squash crop. Tomatoes yielding well, over 50 trays harvested on 8/21. Late cutting of Hay in Veg. D and Central Northeast fields, and raking too, hoping to get crop in before arrival of Hurricane Issac. Crew introduction to harvesting zinnias – stem size, where to cut and handling into buckets. Handling 82 hrs: Friend of RCM asked to use our facilities for upcoming event, needed space for many sunflowers. Full training review for crew regarding selection and sorting of ripe vs ripening, handling trays and calculating the cost of labor into the actual yield 8/21. Marketing 187 hrs: There was a “market assessment” done on 8/14 as we tried to identify the cause of decreasing sales as compared to last year. The most significant finding was that the amount of produce sold, compared to what it should have earned was consistently inaccurate, sometimes more, sometimes less. One clear difference was the impact of having SO Blueberries last year and not in 2012. The take home message was despite a decent effort to accurately record crop sales, we need to do a lot better recording sales info. Special Projects 8.5 hrs: Delineation of ‘Permaculture Field’, mowing a section to be renovated into hay and defining the remaining area to be planted with Orchard and Perennial Plantings. KG took on the preparations for ‘Tomato Fight’, mowing paths. RCM culminated long hours of planning and prepping with a successful delivery of Flowers for her friends wedding. Last of the “ranchettes” killed by marauding raccoon. End of month Tomato Processing run – 650 pounds of ripe tomatoes for sauce and ketchup. Week 1: Heavy shower associated with Thunder Storm. Week 2: More Thunder storms, noted 2.5 inches in ½ hour, then another 3.5” three days later. Week 3: Finally, Clear weather, conditions drying. Week 4: Dry until last days then saturated with heavy shower. Weather turning cool. Hurricane off Coast of Louisiana approaching. General Observations: The month began with a heat wave reaching an unbearable 102* by the 7th. The heat and dryness continued harshly throughout July killing our crop of fennel as well as some of our chickens in the coop. Midway through the month people from NOFA NJ stopped by to film tools being used for a video to raise money for tools for the incubator farms at Duke Estates. With multiple days of heat over 100*, and only three days of rain at the end of the month, July was very irrigation dependent month for us at North Slope Farm. Equipment 11.5 hrs: There was not too much use of equipment in July. A broken sprayer hose left KG smelling terribly while MR rechiseled the Veg C North and then rototilled it. 7/25 KG and RR tilled planted and cultivated Veg C NorthThe month ended with KG mowing production fields, edging two fields in the Veg Field; while MR chisel plowed Veg A’s and B’s which were the 1st succession field for 2012. Administration 31.5 hrs: KG presented on his special project of growing micro-greens in which he discussed farm sponsorship vs. individual venture. MR requested that KG publish a special projects proposal as well as accounting for every step accurately and completely. 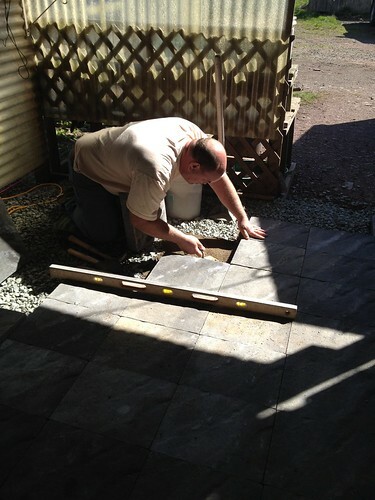 On July 10th MR began working on the Juyly 2011 summary and works on payroll and bills. 7/19 the crop availiblity was updated on the website, and documents were prepared for a Workman’s Compensation Audit. Infrastructure 55 hrs: About half as many hours were spent on infrastructure this year as there were in 2011. On the 4th irrigation and fertilizer were put on the kale. 7/11 two chickens are found dead at different parts of the day, both of which look like they could have been killed by the heat. Ocho was found in the hoop house maybe assisting with the rat problem, while Diez remains hidden in the seed shed frightened. On July 12, while driving down rt. 31 to make a recycling run the fuel gauge went to completely empty and the gas light of the truck suddenly turned on, eventually the light went off and the gauge returned back to ¾ of the way full. Contiunally irrigating even into the late evening we had trouble keeping up with the heat and dryness. Chicken coops were cleaned and moved on the 17th, 24th, and the 31st. Also on the 31st the fruit in the walk-in cooler was mouse-proofed. Greenhouse 36 hrs: With most of the seedlings planted the work in the greenhouse was minimal in July. KG and RR thinned chard and kale seedlings. On 7/18 CH seeded the early fall succession of herbs which included parsley, dill, bee-balm, lavage, mt. mint. July 24th the 5th succession of kale, chard, leeks, scallion, fennel, zinnias, sunflowers, and beets were finally seeded. Composting 12 hrs: On 7/4, 6 cyds. of compost was spread on Veg C North 1st bed. 7/17, 19.5 cyds. were spread on Veg C North finishing the bed, 7.5 cyds. were spread over the Big Garden Beds, and 3.5 cyds. were spread on miscellaneous furrows. Planting 64 hrs: On the 4th of July the poorly germinated beet beds were renovated and basil, beets, and nappa cabbage were planted. 7/5, Veg C North was planted with basil, chard, and parsley. On the 6th the Big Garden Bed’s; 8 West and 8 East, were seeded with the next succession of salad mix. 7/9, the 3rd planting of parsley was re-planted. On 7/12, MR and RR went out to find a spot for late tomatoes and winter squash along rte. 579, the beds were then mowed and ripped while KG planted the remaining succession. 7/13, zinnias were planted in the 579 bed, and a short bed of wrigley’s spearmint was also planted in the Corner Garden. On 7/18 KG and RR direct seeded two beds of field salad, two beds of carrots, and a partial bed of turnips; RR then planted two rows of winter squash in Veg B South. On the 19th with a small amount of rain the night before 13 beds remained to be direct seeded: beans, beets, chard, cucumbers, and summer squash. 98 plugs of sweet william were planted in the corner garden also on the 19th. 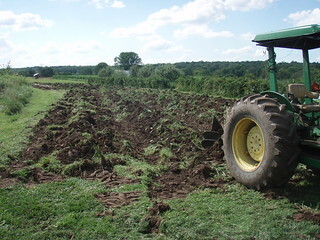 7/25, was filled with planting new girl tomatoes in the new 579 beds and in the farm house gothic, as well as planting chard, kale, leeks, and scallions in Veg C North finishing the planting for July. Crop Care 196 hrs: Because the month was so dry irrigation became a very large part of crop care in July with 53 different entries in the systems log. Weeding in the Big Garden Beds began on the 3rd as well as the stringing of tomatoes and the brewing of nettle compost tea for 6 beds of tomatoes. On 7/10 Ralph’s house was weeded and trellised and the newest carrots, Veg C South tomatoes, and 579 basil were hand weeded. 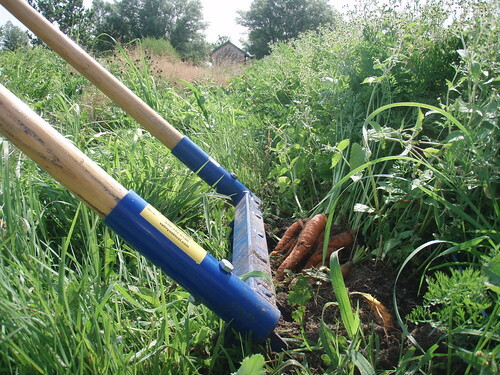 On 7/12 the dreaded weeding of the strawberries took place, after that the west and east bed of asparagus was weeded. After a Field Moisture Test with the soil probe on 7/16 it was found that every major area of production needed irrigation. The month of July continued and passed with constant trellising, irrigation, and weeding. 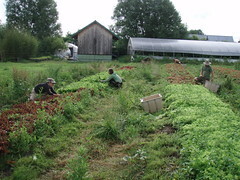 Harvesting 417 hrs: Basil 38 bn, beets 168 bn, beets 442 lbs, carrots 200 lbs, chard 392 bn, eggs 102 doz, field salad 276 lbs, cut flowers 103 bn, kale 137 bn, micro-greens 45, mint 5 bn, nappa cabbage 86 lbs, parsley 26 bn, scallions 16 bn, summer squash 378 lbs, strawberries 94 pp, sungold tomatoes 164 pt, cherry tomatoes 54 pt, turnips 88 bn, turnips 130 lbs. On the 12th of July we harvested our Negovia carrot trial, with 80 days the carrots had medium germination, and decent growth however there about 1/3 of the crop that was subprime with many multi-branched carrots and many rodent chews on the tops. On 7/26 we harvested our first cabbage which was fairly eaten. Small salad plants on the 27th kept us from harvesting salad mix. Handling 71.5 hrs: On the first day of July our second batch of Echinacea was stripped and stored. 7/13 the harvested garlic was cut, sorted, and put away by RR and TH. On 7/24 the first cutting of L. Verbeva was stripped and stored. 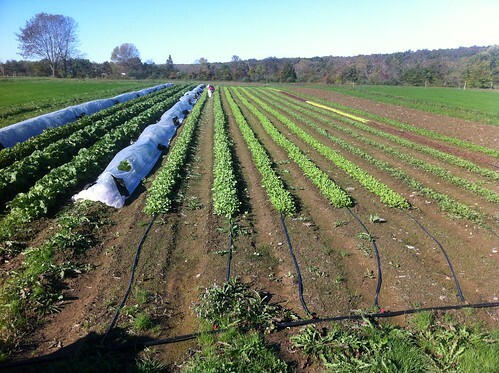 The rest of the month’s handling time went to washing station where throughout the month of July the harvested hardy greens, salad mix, and root vegetables were cleaned. Marketing 119 hrs: On 7/1 after a very hot but still profitable market in Summit, we received the map of the layout for the market move on July 22nd. The first market of the month in Hopewell was moved to Tuesday July 3rd, and was very slow, it was here that KG trained TH on filling out harvest sheets. 7/7 was the first sale of the micro-greens which sold slower than expected due to the fact that people did not know what to do with them. At WWCFM on 7/14 even with the market seeming busy and no other vendors having salad mix we still came out with only $844. Special Projects 17 hrs: On July 5, a new special project was started, headed by KG, to introduced micro-greens into our selection at market. KG wrote a special project proposal and was asked to account for work hours, materials cost, handling description, an established wholesale value per unit, materials that have been already purchased. Micro-Mix seed $15/ #1/4 estimate seeds 10 trays; seed cost=$1.50 per tray. 7/6 the first succession of micro-greens was harvested, it was noted in the log that the trays need to stay level. On 7/8 KG planted his 3rd succession of micro-greens and created a data sheet for the seeding dates, yields, etc. On 7/23 MR presented at the NOFA Twilight Meeting on the NSF Training Program and Farm Tour. Weather: Very Hot and Dry with Heat-waves threatening both crops and chickens, only three days of rain. Week 1: Heat-wave all week +95*, 102* on Saturday. Week 2: Dry conditions cause crop lose due to insufficient irrigation. Week 3: Heat continues, dryness continues, high need for rain. Rain finally comes overnight 7/20, .9”. Week 4: Still hot, rain 7/27-28 equaling 1.75”. General Observations: May is a busy month for North Slope Farm and 2012 was no exception. With the first harvesting of salad, field kale, field chard, and radishes; the planting of the 4th succession, and the fox that kept stealing chickens the crew had their hands full. The unpredictable May weather gave a little flexibility with short periods of rain with sun in-between. Equipment 79.75 hrs:JD:9.5, Ford:13, Case:11, Kabota:24, IH140:8.75, Walkin Mower:4.5, BCS:0.5, Weedwacker:8.5. On 5/8 a bolt was tightened on Big Red ending the squealing noise. 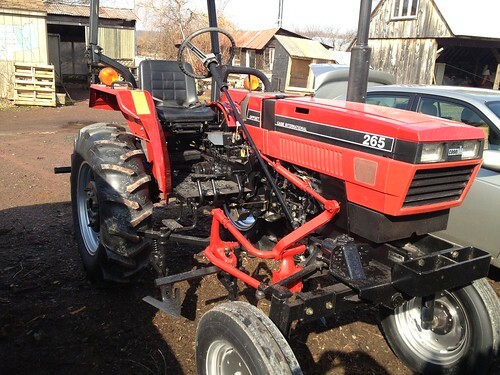 10 days later KG found the Ford Rototiller was overheating, the engine was then cleaned from all debris. Administration 45 hrs: On 5/1 there was a crew meeting discussing ‘special orders’. 5/3 KG finished the monthly summary for May, 2011. On 5/15 MR discussed ‘cost of production’ which derives from the total work hours of harvesting and handling. Infrastructure 142 hrs: May began with a heavy amount of mowing, weedwacking and protecting the chickens from the devious fox. 5/3 the walk in cooler was cleaned. 5/8 half of the MSEN was mowed to prepare for the chicks move, the fence was tended and the chicks were secure from the fox. 5/9 Hens were moved into the fence. On 5/13, 30 minutes after sunset the chicken pen was about to be closed when there was evidence found of a fox attack, electric fence did not deter the fox. 5/16 fence tested with amp meter, weak spots were found and repaired. Greenhouse 105.5 hrs: Things in the greenhouses started off slow for the first two weeks of May. On 5/9 nettle tea was applied to the tomatoes seedlings which were then sprayed for aphids and taken out of the greenhouse. 5/13 Neptune’s Harvest fertilizer was added to the tomato seedlings that would be for sale. The second half of May became more interesting with the discovery of jewel weed growing in the east edge of the greenhouse, the potting on of the black eyed Susan’s and the 4th succession of seedlings for sale on 5/16. On May 30th, the 4th succession of veggies was started. Composting 26.25 hrs: In addition to the compost sifted for potting and seeding the garden and flower beds got their fair share of composting as well. On 5/9, the Big Garden Beds, and Veg. B North were each given 3.5 cubic yards, while 4 cubic yards was given to the Corner Garden. On 5/17, the Big Garden Beds were given 3.5 more cubic yards and on 5/20 the flower field was given 7 cubic yards using the spreader. Planting 162.5 hrs: In May the planting began on 5/7 with the planting of flat leaf parsley, and curly leaf parsley in the corner garden. On 5/11 three rows of tomatoes were planted, one sungold, one striped german, and one brandywine. 5/13, two Big Garden Beds were planted with salad mix and on 5/18 the beds were replanted due to poor germination. May ended with the planting of ½ a row of Echinacea, dill, stevia, chamomile, bee balm, and hyssop on the 28th; and on the 29th five beds of tomatoes, one bed of eggplant, and one bed of peppers were planted. Crop Care 300.5 hrs: Crop care took some attention in May as the aphids attacked and the weeds still grew. On 5/1 KG sprayed second M-PEDE application to control aphids, and remay and mulch were laid over Veg B South for weed control. 5/4 the entire crew was dedicated to hand weeding pea beds in Veg B South. On 5/7 the pathways in the corner garden were weed wacked and the peonies and Echinacea were stalked and strung. 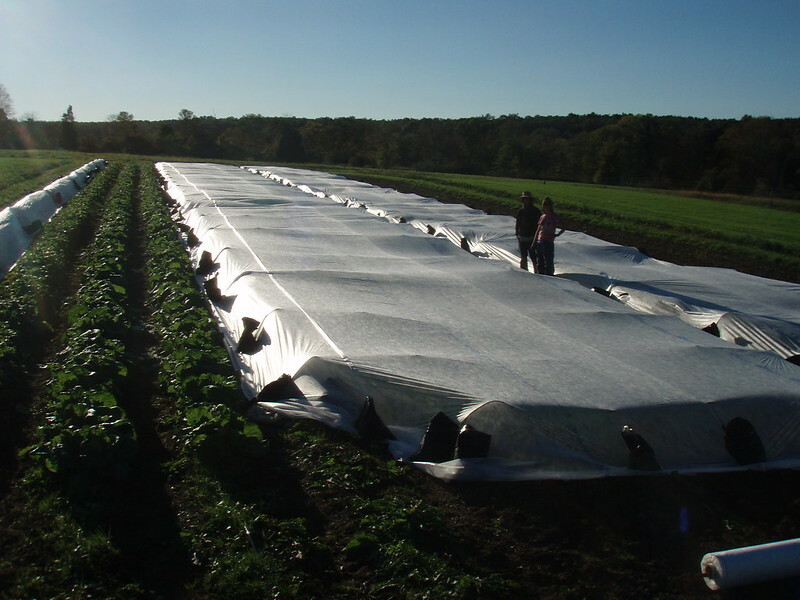 5/8 plastic was spread over BGB’s to protect from rain. 5/9 hand weeded fruit trees from pears to apples. 5/18 BGB’s irrigated and weeded, weeding revealed that the carrots need to be replanted; rerototill and replant! On 5/24 while weeding workers were chased off by lightning and forced to weed gothic flower beds, stake zinnias, and sunflowers. Harvesting 347.25 hrs: May is a busy month for harvesting, for the workers this made up the majority of their time. 5/2 was the first harvesting of the first salad succession, and the last of the spinach. On 5/4 the first harvest of field kale & chard, also the first harvest of radishes though some were damaged by slugs and insects. 5/18 harvested comfrey and catnip, comfrey filled solar dryer and catnip filled the greenhouse. The remainder of harvesting in May was spent with strawberries, field salad, chard, kale, turnips, asparagus, radishes, and arugula. Handling 105.5 hrs: 5/1 began with the washing of eggs which yielded 28 dozen ex-large and 4 dozen large eggs. On the 4th the walk-in cooler was set up again after being washed the day before and the wash are was arranged, this was followed b a demonstration on washing lettuce. 5/18 a demonstration was given on washing tender greens which included sanitizing, plunging, draining, spinning and finally bagging. Marketing 166 hrs: The first Market of May was a slow one due to rain. 5/5 began North Slope Farm’s 9th year at the WWCFM. As May pushed on the Hopewell market continued to be slow and rainy, however on 5/12 WWCFM had a beautiful day which was very busy. 5/13 in Summit a record amount of salad was sold at 63lbs, as well as 70lbs of kale, and 70lbs chard! 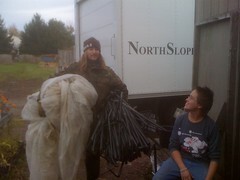 Special Projects 14 hrs: On 5/11 Nettles were bagged for Cherry Grove Cheese to make Nettle Jack Cheese. On 5/16 Ben from Highland Gourmet supplied the seeds for approximately eight flats of watermelons, and on 5/17 the watermelons were seeded. Weather: No mention of frost in log, total rain fall 4.25’. Week 1: wet and rainy, sun just peaking through, and back to rain. Week 2: started off with rain, finally getting sunny, heavy showers. Week 3: clear and sunny, ground started to get dry and in need of irrigation. Week 4: rain in the forecast, thunderstorms on the 24th and 29th totaling 2’. Rainy conditions from late summer rolled into October leaving behind saturated conditions. First week saw clear skies but that led to continued rain through the second week. 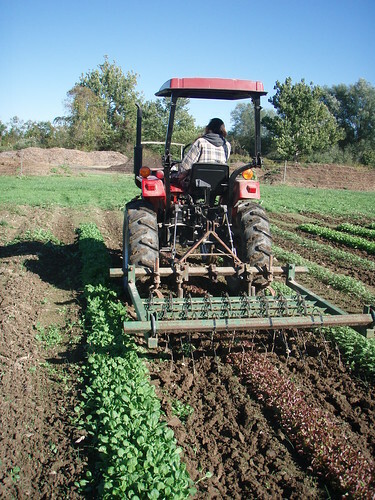 Mid month saw the planting of the BGB’s with fennel, scallions, kale and beets as well as winter cover crops. Special projects included a newly built loft in the seed shed and harvesting throughout the month included tomatoes, carrots, salad mix, arugula, tot soi, scallions, peppers, tea and parsley. 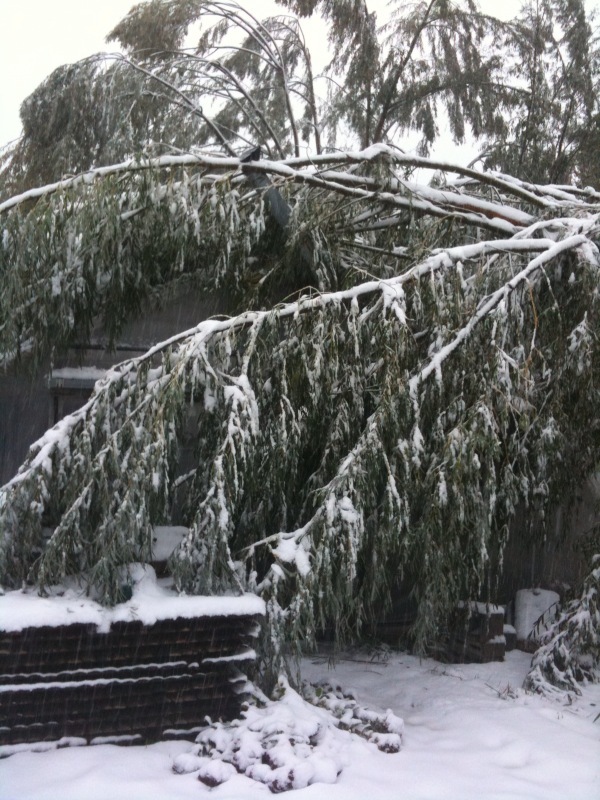 The month came to a close with an unprecedented snow storm that dropped about twelve inches of snow and took the power out for three days as a result of snow covered tree branches falling on power lines. Most of these hours were dedicated to trying to fix the Kabota which was difficult to start at the beginning of the month and by the third week it wouldn’t start at all. The crew backblew the fuel line, bled air successfully, but it still would not work. Normal payroll duties and filing of 3rd quarter payroll tax returns. $30,000 balance in bank account seems to indicate above break even cash position and potential exists for full payment of 2011 liabilities. Crew worked on element focus for next year and created new map folder. End of month crew meeting to discuss remainder of season and markets also took place. Plan discussed regarding the coming cold weather strategy to cover beds with plastic and remay. Chickens moved to new locations along with other normal chores. Identified need to find winter housing for chickens and the 2011’s are getting too big for their coop. Location still unidentified at end of month, but future logs indicate the 2011’s ended up spending the winter in the farmhouse gothic. Cleaning and stowing equipment for winter was part of normal cold weather preparation. The power went out in the farmhouse due to snow storm for two and a half days. The basement flooded and was pumped out with a gas powered water pump. I assume winter production seedlings were tended to but no log entries to verify that. Cleaned piles and received horse manure and shavings from Charlie Gilbert on 10/6 and one load of piled on heavy base of woodchips. On 10/18 the crew composted garlic beds plus seven others, nine total beds composted. On 10/11 the crew weed wacked, broad forked and fertilized BGB’s in order to plant fennel, scallions, kale & beets. Planted winter cover crop-triticale rye, hairy vetch and Austrian winter pea at five times recommended rate due to late seeding and rough manner of seeding including disking to cover the seed and forecast of lots of rain. Germinated well, chickens began eating it but figured it was ok as a result of the heavy seeding. 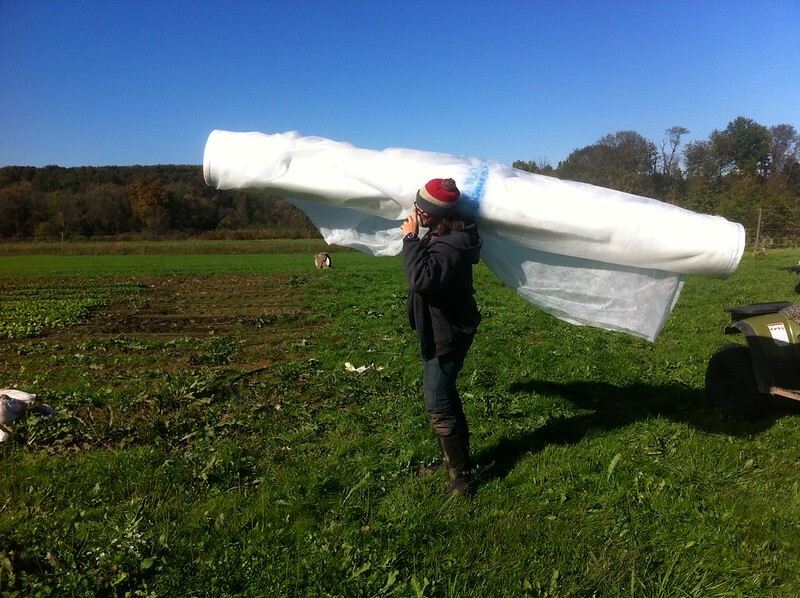 End of month saw the preparation of field beds for garlic, 3 beds planted on 10/25. The crew forked the old basil bed in corner garden, seeding with spinach to overwinter, saw good germination 30 days later. 10 Entries for irrigation during the month, mostly Ralphs house and Farmhouse Gothic. 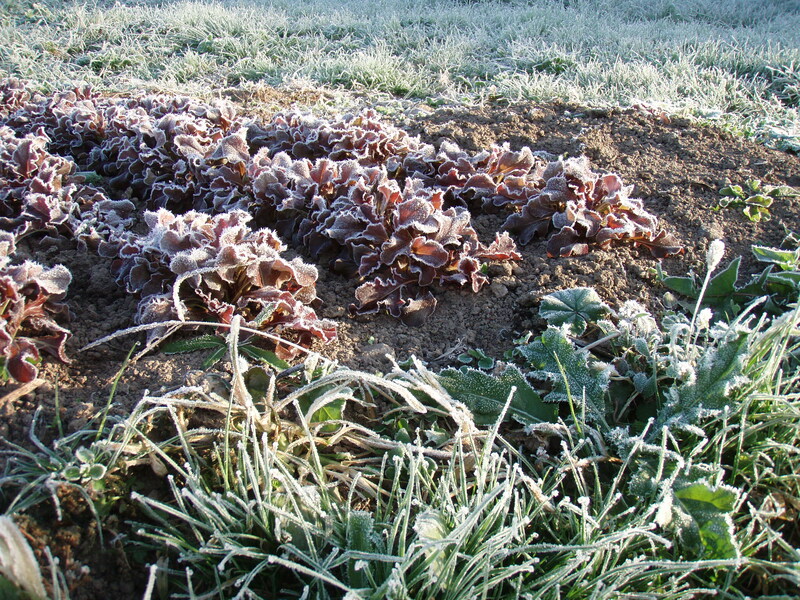 On10/5 hoed new salad mix in the west beds and on 10/6 hand weeded the BGB’s. Cleaned up tomato fields starting mid month. Set up rebar and remay on beds in preparation for cold days ahead. Normal handling of salad mix, kale, chard and carrots took place. The crew came up with the “swirling bucket” technique for washing carrots, presumably to make cold weather washing more bearable. NOFA NJ requested veggies for their winter conference, no word on whether any were delivered. There was some discussion of viability of Hopewell market through November considering low customer base and high rent. Cutting Hay in Veg D led to getting stuck as soil was too wet to pull implement. On 10/10 39 hay bales were harvested. Lots of wood splitting for the farmhouse, and a new loft was built in the seed shed. Total cost was $560 and completed with 10 worker hours. Week 1: lots of rain, saturated conditions. Week 3: Dropping temperatures but clear skies. Week 4: First frost and a Halloween blizzard to end the month.